Industrial garage doors come in different styles that could include roller doors or roller shutters. Garage doors for commercial purposes need to have certain qualities to serve their full purpose. Unlike residential garage doors, commercial garage doors are needed for much larger spaces, are used more often and need to be accessible by a large group of people. Add to those requirements the need for security and a smooth operating mechanism, and it can be difficult deciding what kind of garage door you need for your commercial space. We have listed a few characteristics that are necessary for industrial garage doors so that you know exactly what to look for. These tips will help you select a garage door that suits your business needs perfectly in the most cost-effective manner. Your commercial garage doors need to suit your commercial property. If you have an industrial setup, then you will need to choose doors like heavy-duty roller garage doors. Especially if there is going to be a great deal of traffic going in and out of the commercial garage, you will need garage doors that can withstand daily repeated use. Commercial garage roller doors have been specially designed to undergo multiple rolls in a day and up to 20,000 cycles in one lifetime. 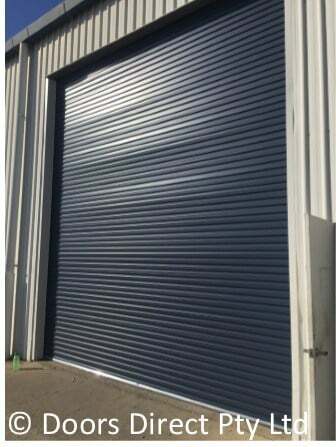 Roller doors for car parks which have a high density of open/close rate can be specially ordered. Choosing the door will also depend on the size of the commercial space. Certain types of garage doors cannot be customised to fit very large garage entrances. Sectional garage doors and roller doors can both be made to fit larger entrances. However, if the space is smaller with little back room, then a roller door is the best option as these types of door open vertically and roll into a barrel at the top of the entrance. Commercial garage doors for schools, hospital, and hotels should also consider fire doors which are a type of roller garage doors. Fire doors also come in a variety of sizes and are designed to protect properties from fire and smoke damage. Industrial garage doors come in different styles that could include tilt garage doors, shutter doors, sectional garage doors, roller garage doors, speed doors, and traffic doors. The style you choose will depend on the business or industry you are running, the number of times the doors need to be opened, whether or not the doors allow access to pedestrians as well as vehicle and the size of the vehicles that need to enter the space. When you have all these details, you can consult with a garage door provider to find the best option. The motor used to raise and lower a commercial garage door will depend on how often the door needs to be opened and closed. For industrial garage doors that need to be raised several times a day, a heavy-duty motor is required which is not only fast but also equipped to deal with the load. Powerful motors are also required for bigger, heavier doors. Less powerful motors can be used for doors that are lighter and don’t need to be raised and lowered frequently. Finally, even an industrial garage door needs to look good and suit the building that it is fitted into. Aluminium and Colorbond steel garage doors can be powder-coated to come in a variety of colours to match any type of building. Doors Direct offers consultations to commercial properties requiring garage doors and provides advice and guidance on the best option to choose. Sometimes, it helps to get an expert’s opinion.